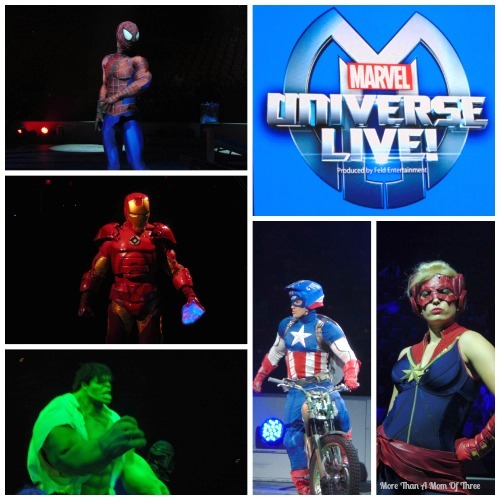 We were invited to attend the opening night of Marvel Universe LIVE last night at the BB&T Center in Sunrise, FL. 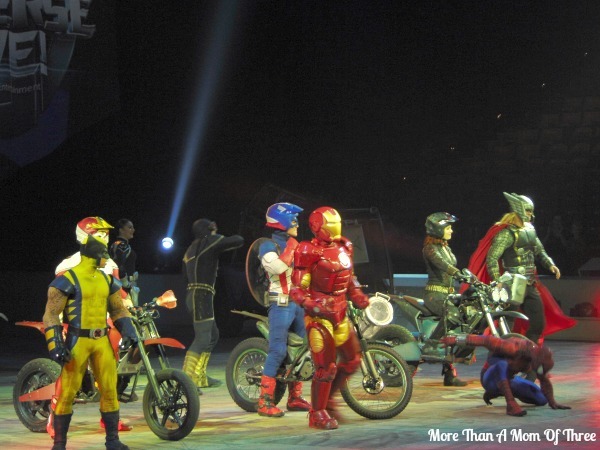 My boys are HUGE fans of the Avengers crew, in their words after we left “best show ever!!”. Our night started out with a VIP event where we were greeted by the cast and crew. They had some fun activities planned. We got to enjoy some superhero dress up, fun make your own shields station and a superhero training course for the kids. 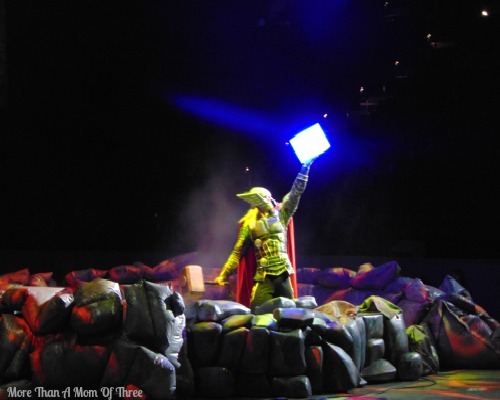 Thor opens the show smashing the Cosmic Cube for fear it will get into the wrong hands. The Cosmic Cube is the source of ultimate power in Marvel Universe. Thor’s villainous brother Loki, tries to attempt to clone the Cosmic Cube to destroy Earth and the entire Universe. Marvel’s biggest superheros must band together to stop the evil Loki from gaining power over the universe. You are taken on a hunt across the globe as the superheros try to find the pieces of the shattered Cosmic Cube to save the universe before Loki clones the cube. Along the way the superheros have some interesting encounters with other villains that have now united forces with Loki to try to gain control over the world. In total there are 25 of your favorite Marvel characters good and bad. Including my kids favorites Iron Man, Spider-Man, Black Widow and Wolverine. A quick visit from the Incredible Hulk was a highlight for them too! Throughout the entire show my kids were engaged with the non stop action. 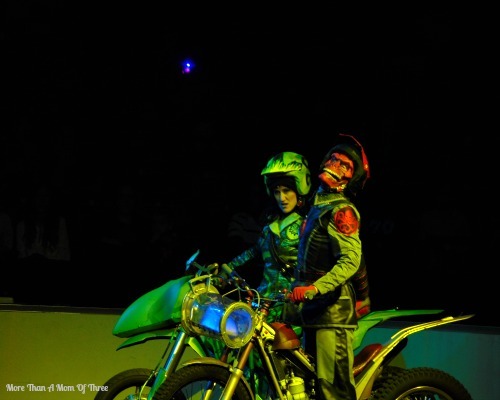 There were motorcycle chases, pyrotechnics and amazing aerial stunts. I don’t think they took their eyes off of the show the entire time. Well, I know they didn’t because they did not even touch their snow cones until intermission. 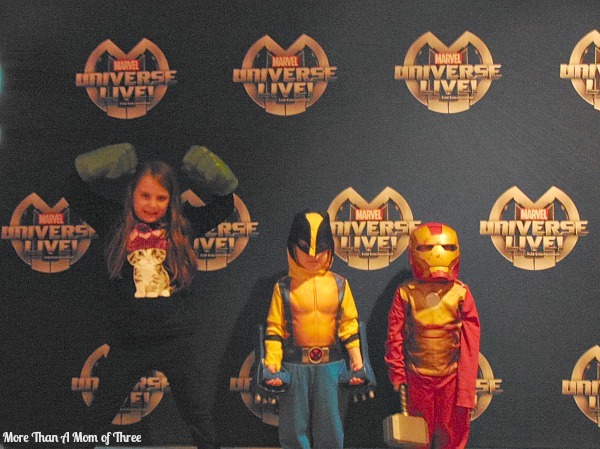 Marvel Universe LIVE was one of the best shows we have seen as an entire family. None of us were disappointed. I noticed even younger children (around 2) deeply involved in watching the stunts of these extremely talented performers. 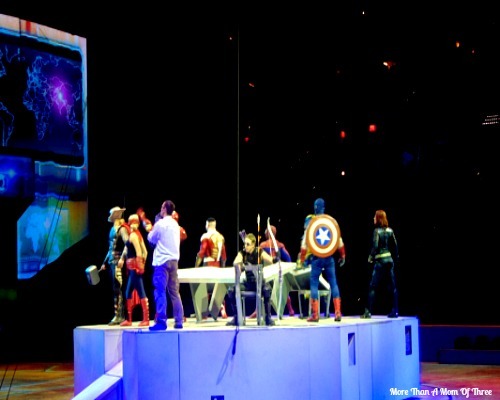 Or check your local city on the Marvel Universe LIVE website. 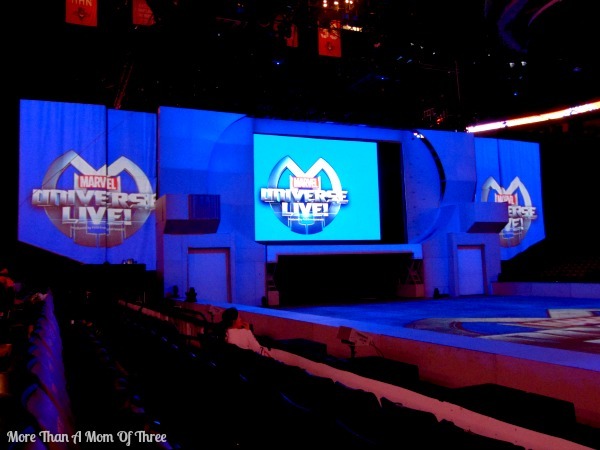 Will you be going to a Marvel Universe LIVE performance? This looks like alot of fun! My daughter is starting to get into super hero’s we will have to check this out next year when she is the right age for this! It looks like everyone had a great time, I love the post you send us about the places to go for kids! They did, I love taking my kids to these kind of events. Its those memories I want to share so others get to experience them too. My boys would LOVE that. LOVE. I didn;t even know this was a show, but I hope it comes to Boston!! I hope so too, I think they are traveling until next year so maybe. Looks like so much fun. I bought tickets this past April for my husbands birthday in May. Problem is, our show isn’t until August or September 2015! I hope you get to go next year, it is sooo worth it! My kids havent talked about anything since we got home. It sounds like you all (especially your children) had a marvelous time! I had no idea there was even such a show as this! What a fantastic family night out! Kristen from The Road to Domestication recently posted…Home Matters Linky Party #15! OMG, that looks like such an amazing show! I need to see if they will be in my area. My nephew would LOVE to go! That sounds like a great show. I bet my brother would love it! My boys and even hubby would have loved this. They are huge Marvel fans! Looks like it was a lot of fun. What a great live performance! I’m sure the kids loved this! I would enjoy this show allot.. i always liked all the super heros.. especially Spiderman! Cia from Cia Says recently posted…I Finally See My Mom For Who She Is. That looks like such a fun show. I think my nephew would love it. Oh my goodness, it looks like so much fun. My son would love it. He’s a big Iron Man fan. Wow, that looks like a lot of fun. I think my kids would have a blast there! This Would be my five year old’s dream come true. My daughter would flip! So much fun! Wow it looks like a great service for small business! This looks like so much fun! I would love to take my daughter to one of these. I wish this would come back to Tampa. We were out of town and my little one wanted to go so bad! Hopefully they will come back around next year for you. My kids would go again it was so fun. I have had a few friends that went and they said it was amazing. It looks like a really good time. This looks like so much fun. It doesn’t come by me until 2016 – we have to wait a while – but it will be worth it!